The consumer ereader market may be trending towards devices that are closer and closer to being tablets, but that doesn't work for everyone. The US Navy, in partnership with Findaway World, is announcing a new basic ereader today. 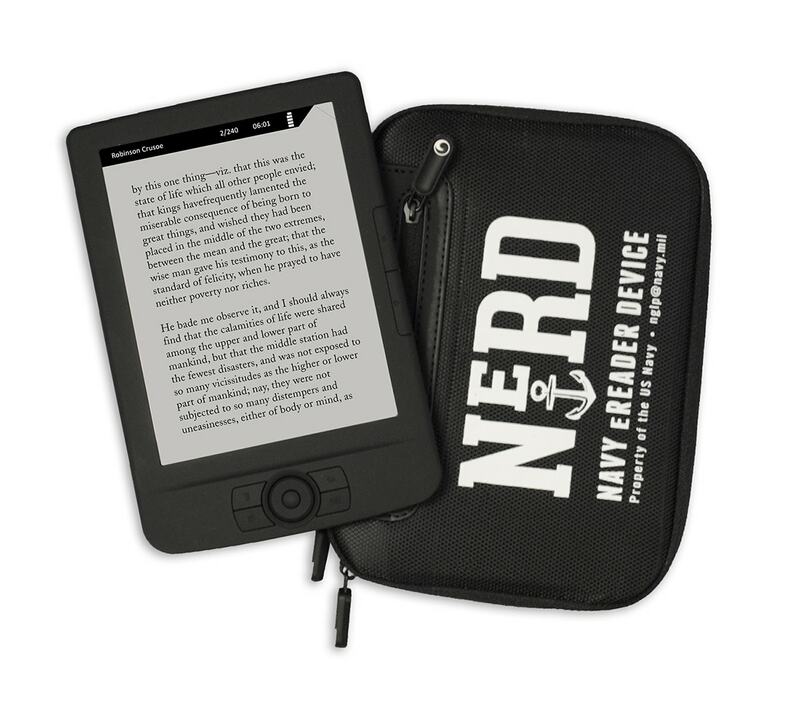 Originally based on a hardware design licensed from a Singapore-based OEM, the NeRD (Navy eReader Device) a 6" ebook reader which lacks a touchscreen or Wifi. It has also been made more secure via the removal of external storage and the USB port. The NeRD is going to be distributed starting this summer, and each unit will come pre-loaded with 300 titles. The content will be a mix of newer bestsellers and public-domain classics, including titles from major publishers like Simon & Schuster, HarperCollins, Hachette and Penguin Random House. This device is the product of Findaway World, which both is and is not a surprise. Findaway World is best know for distributing content (audiobooks, in particular), and they have deals with a number of ebook companies to provide audiobooks for a variety of platforms. But Findaway World also distributes Playaway devices. This is an audiobook player about the size of pack of cards, and you can see one at left. Each Playaway device comes preloaded with a single audiobook, enabling libraries to check out an audiobook title much like they check out a paper book. Findaway World sells them to libraries and institutions everywhere, including all branches of the US military. In short, this Ohio-based company has adapted their audiobook distribution system to support a similarly locked down ebook reader. From a technical standpoint, that is very cool. Update: I now have a partial list of specs for the NeRD. It's running Android 2.3 on a 600MHz CPU (+ 600MHz DSP). The screen resolution is 600 x 800, and the device comes with 4GB of storage. An initial order of 365 devices will be distributed this summer by the Navy General Library Program, which will be using the NeRD to complement its existing ebook library catalog of 108,000 titles. There are no plans for a consumer release, but schools and other institutions that are interested in buying NeRDs should contact your local Findaway World rep. I'm betting they will be happy to sell them to you. What about the battery life ??? I doubt that was affected. But if you are asking how it is charged, there is probably a secondary port.